With the onset of spring, world oil prices rushed up. Barrel Brent has come close to the mark of $ 70. Meanwhile, it became known that Donald Trump intends to expand sanctions against Iranian oil, but to do so so as not to cause a deficit and a new rise in prices. How will OPEC +, Russia and Saudi Arabia react to this? Economists are now increasingly paying attention to the instability of the global oil market. Its balancing by OPEC + decisions to reduce production creates only the appearance of stability, which must be constantly maintained by adjusting the level of production in different exporting countries. However, now there is a new very strong player on the market - the USA. In 2018, America managed to become a leader in world production, and this is precisely the factor that allows Washington to dictate its conditions. Sanctions on oil from Iran and Venezuela, of course, are not accidental. In these countries, mining is falling, while in the US it is growing. The plan is simple - to partially replace the missing oil in the market with American "black gold". Moreover, Trump aims to reduce world oil prices so that domestic prices in the United States also fall, which in the future will give more air to the country's economy. If Washington increases oil exports, prices will go down. However, this is not profitable for Saudi Arabia, which formally heads OPEC. Riyadh just need high prices, high revenues. Will Trump succeed, and how will Russia and Saudi Arabia respond to this? According to Reuters, the United States is thinking of expanding economic sanctions against Iran in May. The reason for this is just amazing. We are not talking about some new actions by Tehran, but simply that May is the first anniversary of the US withdrawal from the deal of the “six” international mediators on the Iranian atom. And this anniversary is a reason for revising the measures. According to Reuters, the new sanctions will be directed against those sectors of the Iranian economy that were not previously affected. The main goal is to continue to reduce exports of Iranian oil. One of the tools of the new sanctions is restrictions on the purchase of oil from Iran by a number of countries. Now there is still an exception, according to which eight states still have the opportunity to buy "black gold" from Tehran and not fall under American sanctions. However, Washington can undo these indulgences. It is worth noting that Washington’s radical demarche on sanctions against Venezuela and Iran has already caused a rise in world oil prices. Since the beginning of April, the cost of a barrel of Brent crude oil has come close to the mark of $ 70, prices are once again storming the November 2018 frontier. Donald Trump, as before, insists on the lowest possible prices, as there is a direct link between the cost of crude oil and the prices of fuel in the US domestic market. However, how does the United States plan to lower world prices, if it seems they are doing everything so that they grow? In 2018, the United States became a new world leader in mining because of the so-called shale revolution. The period of high oil prices last year increased the incomes of American oil workers who modernized shale oil production. It is less costly, since it uses the method of hydraulic fracturing of an oil-bearing stratum, in contrast to traditional methods for pumping hard-to-recover oil, for example, in Siberia. 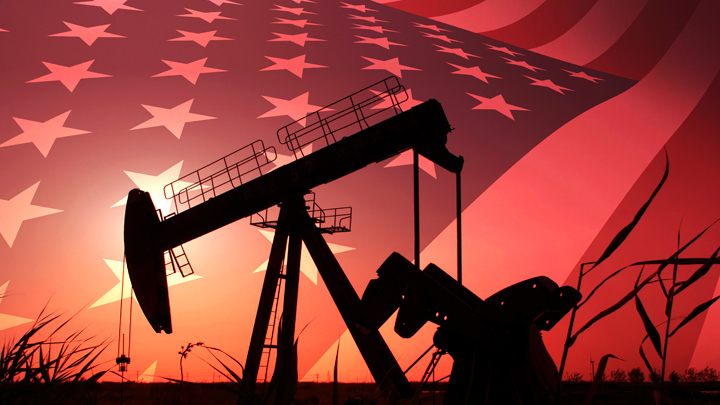 The United States Energy Information Administration (EIA) previously reported that in 2018 the average oil production in the United States was 10.95 million barrels per day. In 2019, it will grow to 12.3 million barrels per day, and by 2020 it will reach 13.03 million barrels. All this unleashes Trump in the situation with Iran, whose declining market share is planned to be replaced. For comparison - Russia and Saudi Arabia produce about 11 million barrels per day. So, the US goal is to remove Iran from the world oil market. And now the moment is getting closer, when Washington will be able to do it both by its own actions and pressure on other countries, causing parallel to Trump's smooth subsidence of world prices by bringing to the market record lots of American shale oil. However, this completely contradicts the actions of OPEC + - the expanded composition of the international cartel of exporting countries, which includes Russia and Saudi Arabia. Moscow and Riyadh, and more specifically, the energy ministers of these countries - Alexander Novak and Khaled al-Falih - regularly hold talks on freezing the level of world production, so that prices are high enough and the market is balanced. The December OPEC + Agreement stipulates that countries reduce daily production by almost 1.2 million barrels, exporting states are also obliged to reduce hydrocarbon production by 812 thousand barrels per day, and non-OPEC countries - by 383 thousand barrels. Trump constantly criticizes OPEC for high oil prices and demands to stop cutting production. However, Russia and Saudi Arabia have their own reasons for doing this. For Moscow, high oil prices in 2018, for example, turned into a record budget surplus of 2 trillion rubles. Recall that the Russian budget was made up at the rate of oil at $ 40 per barrel, while world prices were, in fact, twice as high. As for Saudi Arabia, its affairs are not so good. The kingdom’s budget has already been put up for several years already, on the basis of the price of $ 80 per barrel, and so far the world prices are short of this. IMF director for the Middle East and Central Asia, Jihad Azur, said earlier that Saudi Arabia will continue to have a budget deficit with oil prices below $ 80–85 per barrel of Brent. Thus, high prices are important to Riyadh, but for now they are not high enough. Thus, Saudi Arabia will not openly interfere with sanctions against Iran, but it will clearly not be pleased with the introduction of new batches of American shale oil to the market. However, to prevent this is not so simple. On March 18, a meeting of the OPEC + Monitoring Committee was held in Baku, at which exporting countries agreed to maintain a lower level of oil production until the end of June. As Saudi Minister Khaled al-Falih explained, this decision was made due to the fact that there was a surplus of oil on the world market. Experts estimate them at about 500 thousand barrels per day. It is these surpluses that are an important part of Trump's plan. Why? Because after the introduction of new sanctions against Iran, the market initially will not get a strong blow and will “finish up” the remnants, that is, prices will not go up, which Trump fears. Following the United States against the background of reducing oil production, OPEC + will launch its oil shipments to the market, and prices may go down. In a word, even if prices do not change much, the strategy against Iran will work 100%. And what does OPEC + do? How can the expanded composition of the cartel prevent this, what will Novak and al-Falih take? So far, OPEC + has decided not to force events and provide the first move to Trump. The next meeting of members of the oil cartel was scheduled for April. It was to discuss the timing of the extension of production freeze until the end of 2019, Iraq’s Oil Minister Tamer al-Gadban said earlier. But on March 18 in Baku, the April meeting was canceled, since the countries decided that after the March meeting, it was premature to take decisions on the agreement by the end of the year in April. The decision should be made at a large OPEC conference on June 25, and in May only a monitoring committee meeting will be held. By the way, the United States is talking about May. That is, both sanctions against Iran and the OPEC meeting to determine future strategy will be held almost simultaneously. Experts predict that due to US sanctions against Iran and Venezuela, OPEC + will definitely decide to freeze production in the second half of 2019. At the same time, Russia and Saudi Arabia will have to first assess the implications of US actions for the market. So at this stage Trump has his hands free. But Moscow and Riyadh should carefully monitor that the American provocation on the world market does not have global consequences. After all, OPEC + can regulate production and influence the market with a much more serious cumulative volume of oil than the United States alone. Is that Iran soon as a player in the market can be almost completely eliminated. And these are the consequences of the aggressive US economic policy, which Russia will fight in 2019, relying on Saudi Arabia and OPEC +.